The ‘Great March of Return’ continued on Friday, the 1st of February. The Gaza Health Ministry reported that 32 Palestinians were wounded by Israeli occupation live fire along the border between Gaza and Israel. 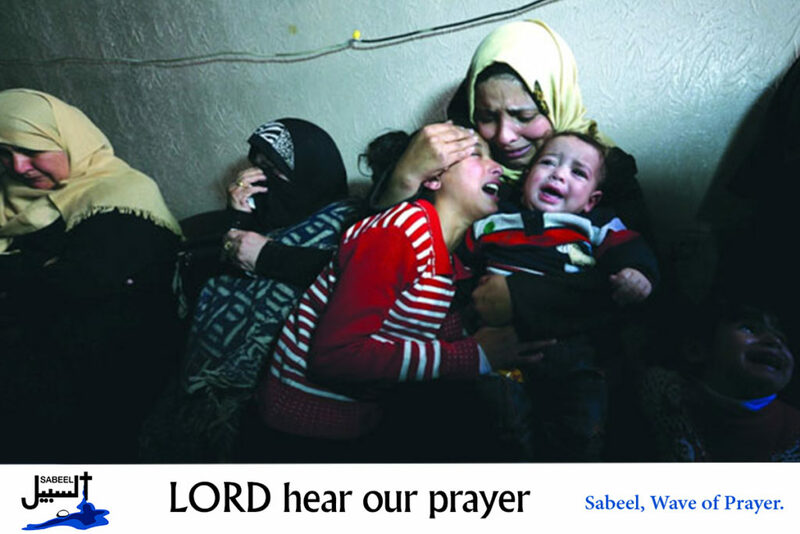 Lord, every week we hear of more injuries and deaths in Gaza and the situation there is desperate. We pray for an end to the suffering and the blockade of Gaza. Lord, in your mercy…. UNICEF and UNESCO expressed deep concern over the rise in Israeli interference in Palestinian schools in the occupied territories. These incidents are impacting children’s safe access to education. In 2018 five schools in the West Bank were demolished or seized by the Israeli authorities. 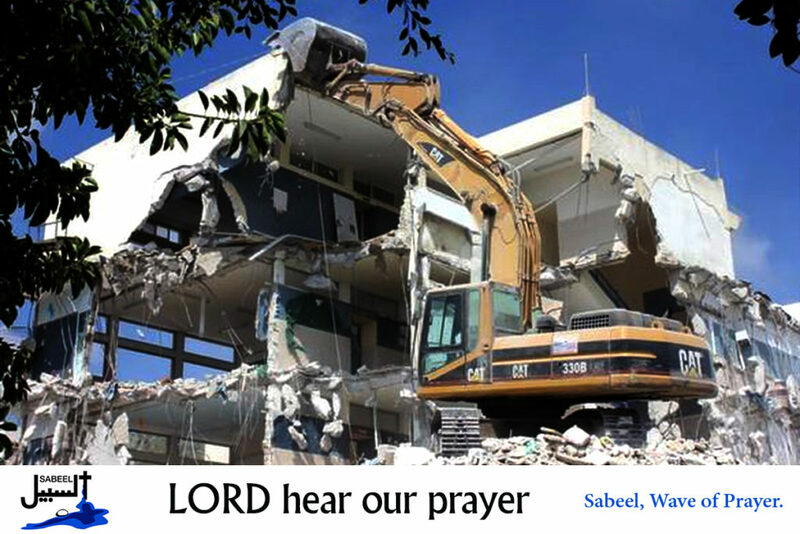 Fifty other schools in the West Bank and in East Jerusalem are presently under threat of demolition. The ‘Great March of Return’ continued for the 44th consecutive Friday since March last year. A young Palestinian, Ihab Atallah Hussein Abed, was fatally wounded and 22 others, including 14 children, were wounded by live fire from the Israeli military. 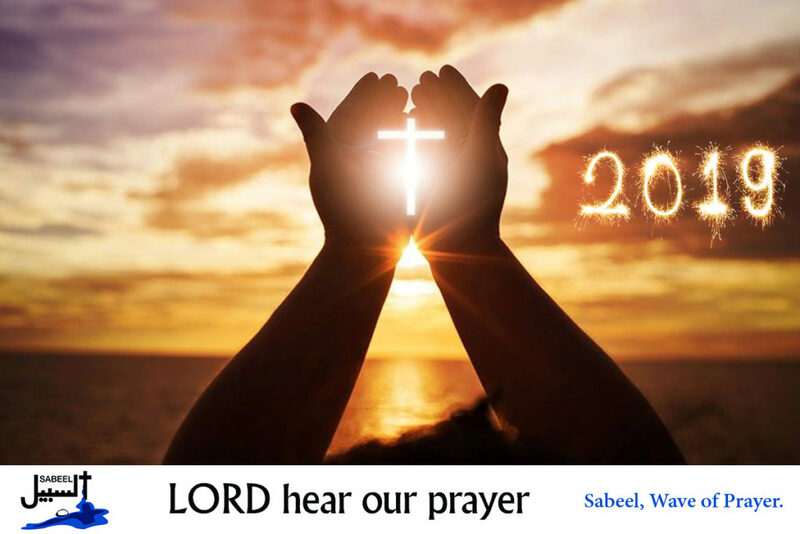 Lord we pray for the family of Ihab as they mourn their loss. 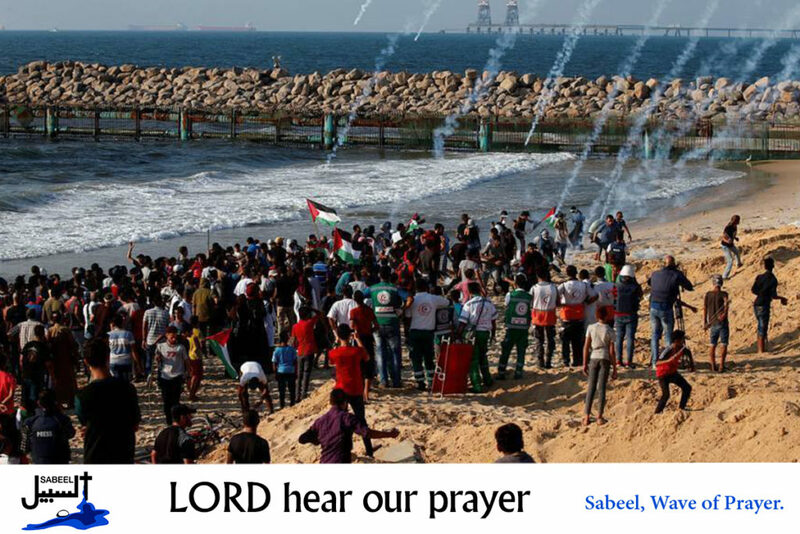 We pray too for an end to the blockade of Gaza and to the dreadful death toll and injuries sustained by the protestors along the Gaza border. Lord, in your mercy…hear our prayers. Israeli forces have assaulted a large number of Palestinian workers waiting to cross Checkpoint 300 from Bethlehem to Jerusalem, causing fainting, suffocation and bruises among the workers. Lord, we pray that the hostile actions of the Israeli forces would cease and that workers be allowed to freely access their place of work. Lord, in your mercy…hear our prayers. Lord Jesus, we remember how you healed all ten lepers, including the thankful Samaritan. Help us, Lord, to show your care for everyone in our communities. We pray for your strength, endurance and patience with joy, as we continue to give thanks to our Father, (Col 1: 11). Lord, in your mercy…hear our prayers. Lord, we pray for the family of Aiia as they mourn her loss and as they grieve over her violent death. Lord, in your mercy…hear our prayers. 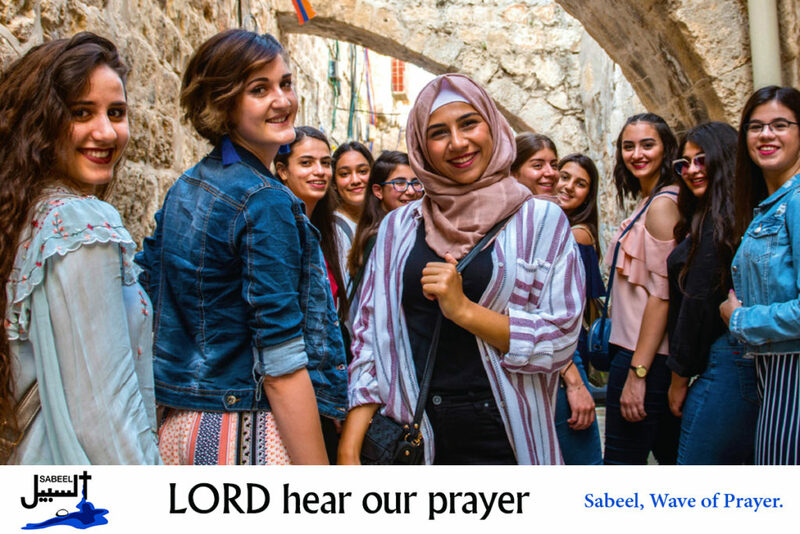 We pray that the sisterhood and solidarity among the young women of Sabeel be a testimony to the strength and beauty of Christ-centered friendship. Lord in your mercy…hear our prayers. Lord, we pray that all those in positions of responsibility in local government, that they would steward their resources in a responsible way. Lord, in your mercy…hear our prayers. Lord, we pray that those involved in the business world would stop to consider how they are making money and the ethical implications of their involvement with governments. We pray for those ready to speak out about the sufferings of the Palestinians living under occupation. Lord, in your mercy…hear our prayers. We join with the World Council of Churches in their prayers for the countries of Algeria, Libya, Morocco, Western Sahara and Tunisia. Lord, in your mercy…hear our prayers. The ‘Great March of Return’ protest in Gaza continued for its 42nd Friday. A Palestinian woman, Amal Mustafa Taramsi and 14-year-old Abed Alraouf Salhah died and at least 25 other people were wounded by Israeli live fire. Egyptian representatives held talks on the day before with Palestinian delegates to prevent any further escalation of violence along the border with Israel. Lord, we pray for the family of Amal and Abed who were killed in the protest as they mourn their loss. We pray too for a breakthrough in the peace talks that there will be an end to the blockade of Gaza and to the desperate sufferings of the people under siege. Lord, in your mercy…hear our prayers. This week the Palestine Solidarity Campaign, (PSC), successfully challenged a UK court ruling. The ruling would have restricted local authority pension funds’ ability to divest from companies on ethical grounds. If the PSC is successful in its appeal to the Supreme Court, the UK Government will not be able to interfere on ethical disinvestment decisions. Lord our God help us to seek you diligently and to walk in your way of righteousness and your paths of justice (Proverbs 8:17-20). We are thankful for those who listen to the Palestinian cry for justice and who seek to find ways to peacefully protest Israel’s human rights violations in Palestine. Lord, in your mercy…hear our prayers. A general strike has been called for Palestinians on Tuesday, the 15th of January. On this date the Palestinian Authority requires business owners and employees in the private sector to sign up to the Palestinian Social Security Institution. This institution has been set up to provide pensions and insurance benefits. However, many protestors are mistrustful of the Palestinian Authority and its intensions. Dear Lord, we pray that the general strike will be peaceable and that the grievances of the protestors will be addressed by the authorities concerned. Lord, in your mercy…hear our prayers. 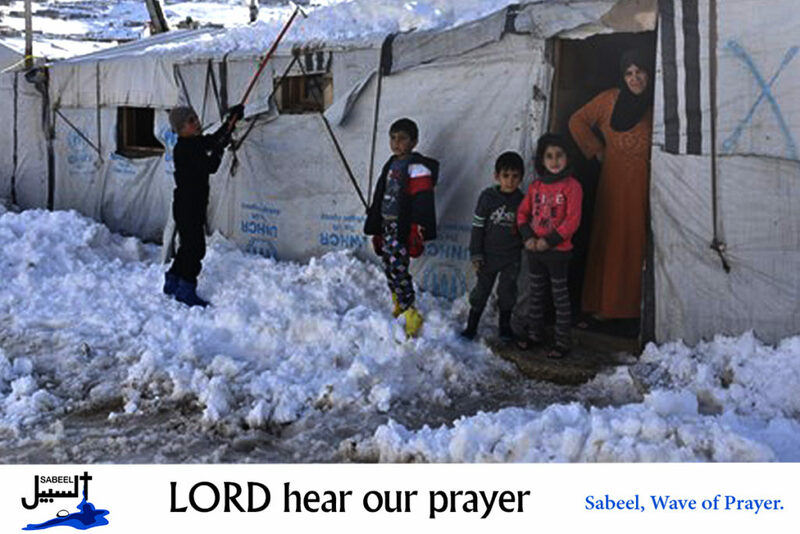 Thousands of Palestinian and Syrian refugees in the Middle East are suffering from severe wintry weather conditions. Storm Norma which started on Saturday, the 12th of January, hit Lebanon and Syria this week with heavy rains, snowfall and freezing temperatures. Many refugees had to be rescued from flooded camps. Lord, you knew what it was like to live as a refugee when you were born into this world. Help us to remember the refugee families who have to try and survive extreme cold in temporary shelters. We give thanks to all charities and NGOs who respond to their suffering with emergency shelter, fuel and food supplies. Lord, in your mercy…hear our prayers. In the Sheikh Jarrah neighbourhood of occupied East Jerusalem, five Palestinian families have received an order by the Israeli authorities to evacuate a building. According to the Civic Coalition for Palestinian Rights in Jerusalem (CCPRJ), the building would be turned over to Israeli settlers who had claimed ownership of the building. This week’s Kumi Action focuses on the work of the Machsom Watch. Since 2001 Israeli women from the Machsom Watch have been observing and reporting on the Israeli military occupation of Palestine. They are opposed to the occupation and believe it is undermining respect for human rights and democracy in Israel. The Kumi Action asks you to stop and think as you cross a road or leave a building what it must be like for Palestinians who have to pass through so many obstacles just to reach work or school or treatment at a hospital. Lord, we thank you for those who care about human rights and for those, like the women of Machsom Watch, who are prepared to monitor and report on the injustices they see in their society. Lord, in your mercy…hear our prayers. We join with the World Council of Churches in their prayers for the countries of Bahrain, Kuwait, Oman, Qatar, Saudi Arabia, United Arab Emirates and Yemen. Lord, in your mercy…hear our prayers. Lord we pray for the family of Karam as they grieve their loss. 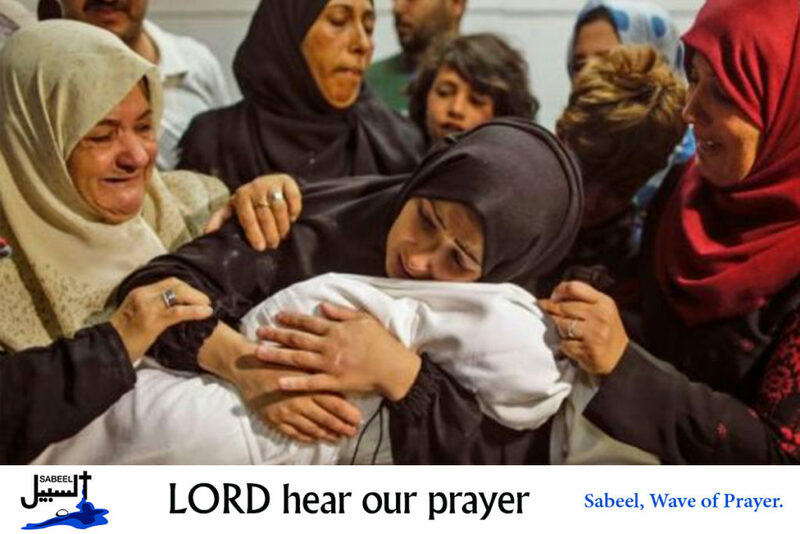 We pray for a breakthrough in the peace talks and an end to the crippling siege of Gaza. Lord, in your mercy…hear our prayers. Israeli forces detained two Palestinian students from Beituniya village in the occupied West Bank district of Ramallah. The mayor of the village, Ribhi Dawleh has stated that Israeli forces are deliberately targeting students in the village with frequent raids and detentions. Lord, we pray for the young students in the occupied West Bank who suffer checks and delays as they travel to their schools and colleges. We pray that they remain determined to complete their studies. Lord, in your mercy…hear our prayers. The war continues in Syria. Lord, we pray for the people of Syria and the Golan Heights who have lived with destructive warfare and unrest over the past few years. We pray for peace in this country and the resettlement of those who have had to flee their homes. Lord, in your mercy….hear our prayers. 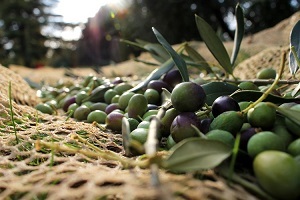 There has been plentiful rainfall in Palestine and Israel this year which will soften and refresh the land ready for the farmers to plant their crops. We remember the poor who suffer in the cold and wet conditions of winter. Teach us, Lord, to be thankful at all times, to encourage one another and to seek to do good to one another, knowing that this is your will for us. Lord, in your mercy…hear our prayers. The United Nations’ World Food Program, (WFP), has warned that a severe funding shortfall in Palestine is expected to affect 193,000 of the poorest people in Gaza and the West Bank in January. Assistance from the WFP goes to the most impoverished and ‘food insecure’ communities. Lord, we pray for those who struggle to feed their families in Gaza and the Occupied Territories. We pray for the support of those in need. Lord, in your mercy…hear our prayers. After a ruling taken by the Palestinian Constitutional Court, President Mahmoud Abbas has announced the dissolution of the Palestinian Legislative Council. Legislative elections should now take place within six months. 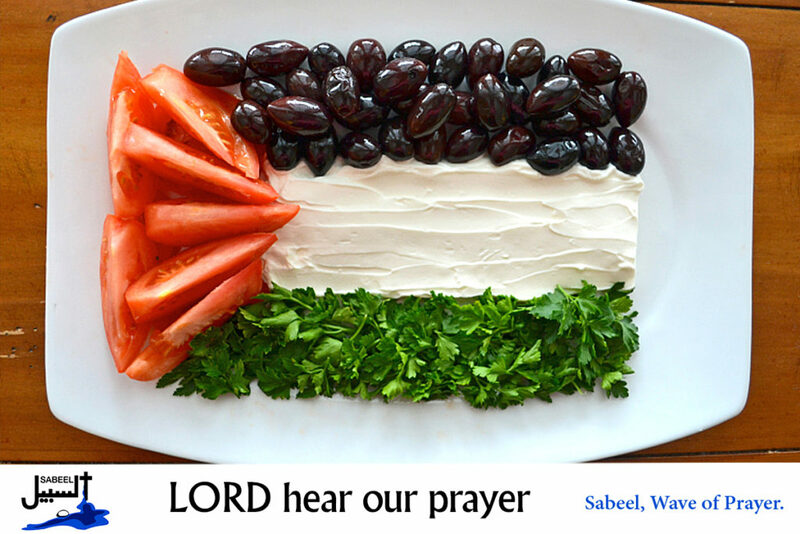 Lord, we pray that the Palestinian people will hold free and fair elections to the Legislative Council. Lord, in your mercy… hear our prayers. This week the Kumi Now non-violent initiative is focusing on the work of the Evangelical Lutheran Church in Jordan and the Holy Land, (ELCJHL). The Kumi Now action requests that Christians around the world heed the cry of Palestinian Christians for justice. It asks them to offer, to speak or pray about Palestine and Israel in their local churches. Lord, we pray for the work and witness of ELCJHL in this land of the Holy One. Bless the Kumi Now initiative and all those who use it as a pathway to a just peace in this land. Lord, in your mercy… hear our prayers. ‘The Great March of Return’ continues into its 39th week. Four Palestinians were shot and killed, including Muhammad Muin al-Jahjouh,16, by Israeli forces at the eastern borders of Gaza, while over 40 Palestinians were injured. The photograph of Palestinian demonstrators taken along the Gaza borders on April 6th, 2018 by the Reuter’s photographer Mohammed Salem is one of the many memorable images included in ‘The Israeli-Palestinian Conflict through the Lens in 2018’. Hundreds of Israeli settlers, accompanied by Israeli soldiers, raided the Greek Orthodox Monastery of Mar Saba, east of Bethlehem, in the occupied West Bank. The raid was timed to disrupt the devotions of the Palestinian Christians who had come to celebrate the feast of St. Saba. Hudhaifa al-Hariri from Umm al-Fahm in northern Israel died in hospital after being shot at an incident at a petrol station near the Megiddo junction. Four other separate shooting incidents took place in northern Israel this week. Crime among the Israeli Arab citizens is on the rise, while the Israeli government ministries neglect the basic needs of the Arab sector. ‘Banat Al-Quds’, (Daughters of Jerusalem), in a concert to launch their new CD on Tuesday, the 18th of December, at a cultural centre in Jerusalem. The choir sings together with a Norwegian choir and the Princeton Girls’ Choir from the USA on the CD. At the United Nations in New York, the countries of the UK, France, Germany, Italy, Sweden, Belgium, the Netherlands and Poland reiterated the EU policy on Israel/ Palestine. It confirmed its support for a two state solution, with Jerusalem as the future capital of both states. This week the Kumi Now non-violent initiative is asking its participants to give feedback on the Kumi actions. This will be the first of three specific times throughout the year when feedback will be especially welcome at: feedback@kuminow.com. We join with the World Council of Churches in their prayers for the countries of Japan, North Korea, South Korea and Taiwan. 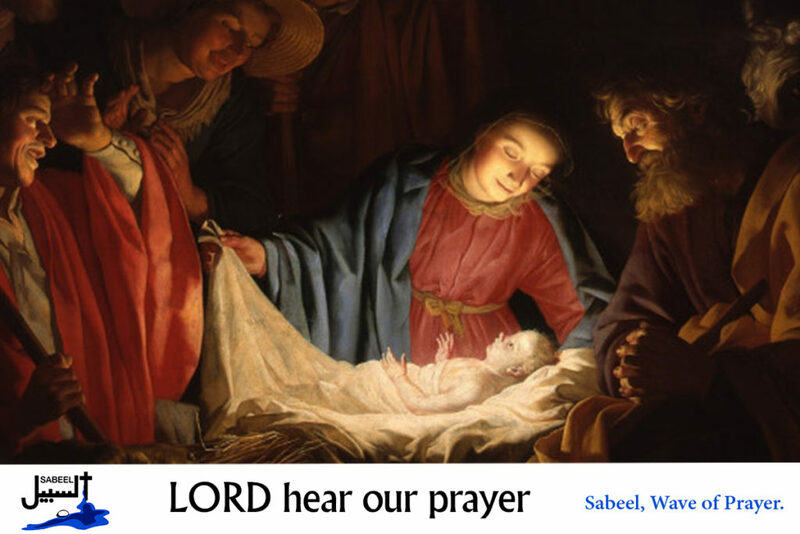 Lord, in your mercy…..
Mary said,” Behold, I am the servant of the Lord; let it be to me according to your word.” (Luke 1:38) Lord, as we remember the birth of our Savior in Bethlehem we think of the many Palestinian children born in the refugee camps in the occupied territories. We pray for hope and a future for them through a just and equitable peace with Israel. Lord, in your mercy…hear our prayers. Zechariah prophesied, saying, “..the sunrise shall visit us from on high to give light to those who sit in darkness and in the shadow of death, to guide our feet into the way of peace.” (Luke1:78-79) Lord Jesus, you are our Saviour and Redeemer. Your light brings us hope where there is no hope. Help us, Lord, to continue to work for peace and justice where we see inequity. Lord, in your mercy…hear our prayers. All this took place to fulfill what the Lord had spoken by the prophet: “Behold, the virgin shall conceive and bear a son, and they shall call his name Emmanuel, (which means, God with us). (Matthew1:22-23/Isaiah7:14)Lord Jesus, we are thankful for the Christian Peacemaker Teams and their work to monitor abuse, particularly the abuse of young children. We pray that they will be strengthened by your presence. Lord, in your mercy…hear our prayers. On Saturday, the 15th of December, Scott Morrison, the Prime Minister of Australia, announced that his country would formally recognize West Jerusalem as Israel’s capital. However, he stated that he would not move the Australian Embassy to Jerusalem until there was a peace settlement between Israel and Palestine. We join with the World Council of Churches in their prayers for the countries of China, Hong Kong and Macau. Lord, in your mercy…hear our prayers. Thousands of people attended the annual Christmas tree lighting ceremony in Bethlehem’s Manger Square on Saturday, the 1st of December. Lord Jesus, the light of the Christmas trees reflect our joy at this season as we remember how you came to earth to bring light into our lives, ‘the people who walked in darkness have seen a great light’, (Is 9:2). Lord in your mercy…hear our prayer. At least 25 Palestinians were injured by live fire during the weekly protests of the ‘Great March of Return’ along the border between Gaza and Israel on Friday, the 7th of December. The Israeli authorities demolished a Palestinian primary school in Simiya village in the southern occupied West Bank district of Hebron on Wednesday, the 5th of December. The Israeli Civil Administration claimed it had been built without a permit. Almost all Palestinian applications for permits in areas under their control are rejected. This week marks human rights week, with the UN Day of Human Rights on the 10th December. Lord, all people have the right to live in peace, dignity and with justice. Grant all those involved in the occupation humble hearts to see the wrongs of their ways and clear heads to move towards peace and justice. Lord, in your mercy…hear our prayer. On Wednesday, the 5th of December, the Irish Senate approved the first reading of the ‘Occupied Territories Bill’. This bill would criminalise the import of goods from Israeli settlements. It will still need to be endorsed by the Lower House of Parliament. Lord, we are encouraged when those in authority abide by international law and recognise the illegality of the Israeli settlements in Palestine. Lord, in your mercy…hear our prayer. The U.N. General Assembly voted in favour of five resolutions regarding Palestine on Friday, the 30th of November. UNGA also adopted a sixth resolution on the occupied Syrian Golan, demanding the withdrawal of Israel from all the territory and affirming Syria’s sovereignty over the land. We thank you, Lord, for all those international bodies who work to maintain peace and to protect the sovereignty of nations. Lord in your mercy…hear our prayer. The Kumi Now initiative focuses this week on the work of Al-Marsad in the Syrian Golan. Lord, we pray for the Syrians who have suffered so much in recent years. We pray that the Syrians in the Golan and in other regions may be granted peace and justice. Lord, in your mercy…hear our prayer. We join with the World Council of Churches in their prayers for the countries of Cambodia, Laos, Vietnam. Lord in your mercy…hear our prayer.